All Inclusive Resorts in Costa Rica For the Ultimate Vacation! Why spend your time worrying about the cost of every meals or cocktail.Go to one of the many all inclusive resorts Costa Rica has to offer and spend your all inclusive vacation relaxing and having fun instead! You never have to leave because everything you need is right at hand. What are all inclusive resorts? All inclusive resorts in Costa Rica offer a stress-free approach to travel. In all inclusive resorts you pay for your room, food and alcohol all in one! You’ll also enjoy the excellent facilities on offer in those great resorts. In addition you’ll find large swimming pools, a range of restaurants, and plenty of entertainment. You and your loved ones are sure to have a memorable all inclusive vacation. Many of the most popular all inclusive resorts are located in Costa Rica’s driest province, Guanacaste. Guanacaste is the sunniest and driest area in Costa Rica so you are guaranteed tropical sunshine and white sandy beaches! Don’t Worry About a Thing and Stay in a Costa Rica All Inclusive Resort! All of us dream of spending vacations in an exquisite tropical location, flanked by lush green rainforests, diving in the blue water and having the time of our lives. Your vacation to Costa Rica can include all of these things and more! It is the best destination for tourists from all over the world. If you decide on an All Inclusive Package to Costa Rica, it will relieve you of many hassles. Luckily, there are several beautiful all inclusive resort in Costa Rica to choose from. Our expert travel coordinators can offer advice which is more useful and convenient than looking for yourself. Working with an agency like My Costa Rica to plan your Costa Rica vacation package will save you from having to do hours of research trying to set up your accommodations, transfers, and tours. Dreaming of a Vacation in an All Inclusive Resort in Costa Rica? There are countless beaches in Costa Rica that offer a chance of watching the various moods of the ocean and indulge in the wonders this country has to offer. The Gulf of Papagayo in Guanacaste Costa Rica and Drake bay in Osa Peninsula have some of the country’s most famous luxury resorts. Just think about the Riu Palace Costa Rica and the Secrets Papagayo Resort and Spa in the Guanacaste region. High on the list of the all-inclusive hotel selection as well as its sustainability efforts is Westin Playa Conchal. Make sure to list your wishes as to which type of resorts you would like to stay at. Maybe you prefer a family resort or perhaps you want to stay at an adults-only resort. Or maybe you are looking for the perfect place for your Costa Rica honeymoon. Exploring a national park is the best way to discover the natural wonders and flora and fauna Costa Rica is known for. There are helicopter tours that take you to Arenal. There are several hot springs surrounding the volcano. This is one of the most favorite sites of tourists from everywhere. There is an impressive water park overlooking the Arenal Volcano. The park includes waterfalls as well as slides to amaze the tourists. Arenal also has the best all-inclusive hotel Central America and even the world has to offer in Hotel Arenal Nayara. Visit the famous Monteverde cloud forest and take a canopy tour. Canopy tours – zip lining, hanging bridges, sky trams, explore the rainforest canopy! Snorkeling, scuba diving, sports fishing, surfing, catamaran cruises – Enjoy the richness of the sea! Unlimited delicious food and drink! Horseback riding, rafting the famous Pacuare river, sea kayaking, hiking, tennis, bocce ball, water sports, dancing at the discotheque, paddle boarding, yoga, spa massage, jacuzzi and more!! Sometimes you just want to go on vacation and have everything taken care of for you – a stress-free, no-hassle and convenient getaway. Fortunately, there are plenty of all-inclusive resorts in Costa Rica where this desire can become a reality. Below we have chosen our favorite all-inclusive Family-friendly, adults-only and luxury resorts for the Costa Rica vacation of your dreams. Combining the needs and wishes of every member of your family during your vacation can be complicated and, in some cases, close to impossible. While you want to relax and disconnect from your everyday work life, your kids might not have the same urge to lay at the beach all day. They want action, adventure and all the things that they can’t do at home. Our picks of the best all-inclusive family resorts will help you balance your wishes and your children desire for all day entertainment. Located in Costa Rica’s North Pacific Riviera, the Westin offers everything that you and your family need for an unforgettable vacation. Besides the Westin Kids Club and the lagoon-style swimming pool, you can also find several off-site activities just around the corner. The best feature about the Westin Resort? All their services are inclusive! Your whole family is invited to enjoy themselves, from world class cuisine to watersports up to the Westin Kids Club, you are guaranteed to have the vacation of a lifetime! The Hotel Riu Guanacaste is a beachfront property on the beautiful Matapalo Beach. This all-inclusive family friendly resort hosts everything that your heart desires. Be pampered at the Renova Spa with a variety of treatments or enjoy the steam and whirlpool bath. But the all-inclusive resort doesn’t end there. Riu Guanacaste also offers a broad range of activities for children, for example the daily entertainment program for kids, the playground or the Miniclub. And if you want to want to spend some quality family time together, you can try out various watersports or horseback riding and make incredible memories, that you will remember fondly for a long time. Costa Rica is great for the little ones, but that doesn’t mean that you can’t have a relaxing adults-only vacation. Leave your stressful everyday work life behind and enjoy yourself at one of the best all-inclusive adults-only resorts in Costa Rica. Adults-only means pool time, sleeping in if you wish, sophisticated environment, open-air massages without a noisy little one in sight (or earshot) and elegant dinners with no kid’s menu. Our top picks for the best adults-only all-inclusive resorts will guarantee you a hassle-free and relaxing vacation of your dreams. 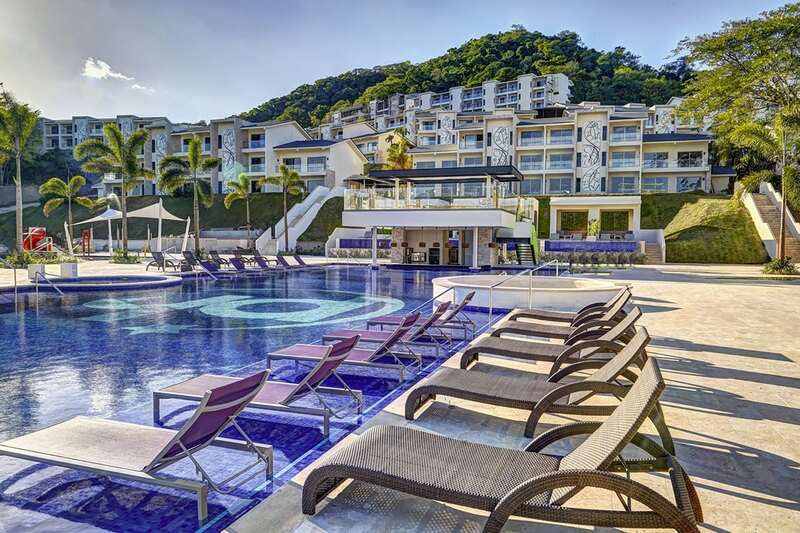 Located on a beautiful seclusive little bay on the Northern Pacific Coast, in the Gulf of Papagayo, Secrets Papagayo Resort & Spa is one of Costa Ricas best adults-only all-inclusive resorts. It not only provides a peaceful and romantic ambiance, but you will also find every service that you wish for there. Treat your mind, body and soul to a variety of treatments and options. If you wish for a little more adventure to spice up your day, you don’t have to go far. On-site activities include yoga classes, snorkel tours, tennis courts, cooking lessons and many more. And of course, the resort is ideal for couples, and singles and welcomes honeymooners. Secrets Papagayo is the place to go if you are looking for a relaxing break from your work life and also possibly the best vacation experience of your life. The Occidental Papagayo is an elegant all-inclusive Resort overlooking Guanacaste’s Papagayo shores. Disconnect from your everyday life with the resort’s broad variety of spa and wellness services. You could even enjoy a different treatment everyday of your stay. From classical massages to body treatments, hydrotherapies and facials, you are guaranteed to feel like a whole new person after your stay. After restoring your energy levels at the spa, go and explore Costa Rica! Take a day trip to the Arenal Volcano and hot springs, explore various national parks or, if you are more on the adventurous side, go on an adventure tour in Borinquén. Secrets Papagayo Resorts & Spa truly offers unique experience to suite every need and wish you might have. Although Costa Rica is a small country—just a speck on the map of Central America—it is far ahead of its neighbors when it comes to all-inclusive luxury resorts and eco resorts with style. The wildlife-rich national parks and beautiful beaches are the top attractions in Costa Rica, but there are some hotels in the area that are destinations themselves. Come for a heavy dose of adventure, wildlife, and bird-watching, but with a luxurious hotel or jungle lodge room to retire to as the sun goes down. Here are our picks for the best all-inclusive luxury resorts to stay at your Costa Rica vacation. If you are searching for your once in a lifetime dream vacation look no further! Riu Palace is located on the edge of the beach of Matapalo and is fully prepared to cater to all your needs. Whether you are seeking a relaxing wellness vacation or an action packed adventure, you will find it at the luxurious all-inclusive resort Riu Palace. Its services range from the Renova spa with different treatments and massages to a variety of activities on the beautiful beaches such as diving or fishing in the Pacific waters, ecotourism in the volcanic areas, and during the day several programs of entertainment. Take advantage of all activities while being surrounded by a sophisticated and elegant atmosphere. Dreams Las Mareas is a one of a kind beach getaway for couples, families and singles to enjoy an escape in a prime location. The all-inclusive luxury resort is located on the palm studded beach Playa El Jobo in the Guanacase region of Costa Rica. During your stay at Dreams Las Mareas you can enjoy the spa facial treatments, spa body treatments or salon treatments. The resorts also features a number of activities for you to explore, whether you would like to try on-site water sports or go on off-site excursions like sunset sailing, fishing trips and many more. Doesn’t matter what you wish for, the all-inclusive and unlimited luxury resort will grant your wish! Costa Rica does not only have an immense variety of wildlife and nature, it also has many different all-inclusive resorts with all kinds of special features. Our top picks of all-inclusive family-friendly, adults-only and luxury resorts will give you an overview of available options and help you plan your dream vacation!